If you want to use Hello to login to Windows 10 with your face, you'll need a special camera for that. Here's a list of Hello-friendly PCs you can buy right now. Windows 10’s biometric login feature, Hello, is one of the few new features that you can’t use with just any old PC hardware, as Hello’s awesome facial recognition requires a special depth-sensing camera. If you’re in the market for a new laptop, Intel just posted a list of current PCs that come packing an Intel RealSense 3D camera—hardware that works with Windows 10’s Hello. RealSense cameras aren’t just for logging in with Hello. The devices can also recognize and respond to facial expressions and hand gestures—part of Intel’s Perceptual Computing concept that the company has been pushing for a few years. If you really want to use Hello and any other features that work with RealSense 3D cameras you can also pick-up an external web cam developer kit from Intel for $100. This is a developer kit, however, and not intended for regular users. It might be wise to wait and see if Intel or other companies produce a Hello-compatible external webcam in the coming months. Why this matters: Windows 10’s Hello feature is part of Microsoft’s war on passwords. The feature also works with fingerprint and iris scans and isn’t just about logging in to your machine. It can also log you in to websites and apps that support Hello under a program codenamed Passport, which was also the name for Microsoft’s original attempt to create a universal login for the web back around the turn of the century. Android has offered facial recognition device unlock for a few years now, but Microsoft’s implementation promises to be far more advanced. For one, Hello’s depth sensing technology is supposed to identify “unique personal characteristics” to ensure it’s really you and not a picture or someone that looks like you. Android’s facial login was famously foiled by a picture when it first came out. 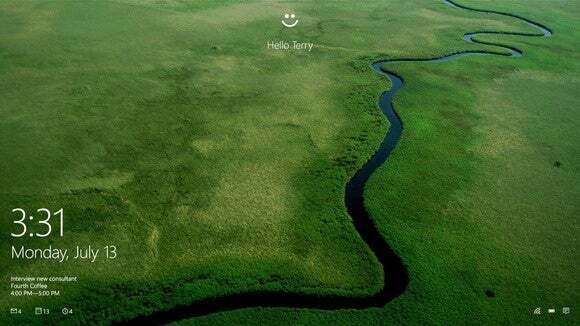 Microsoft has been considering the Hello concept for at least five years. Back in 2010, alleged concept documents leaked from Microsoft showing the company’s thinking about future versions of Windows. One idea was a combination login-proximity feature that relied on facial recognition.